The construction industry will find something to be happy about in Acumatica’s latest release, Acumatica 2019 R1. Contractors in particular will appreciate the usability and functionality improvements benefitting their project teams. When Acumatica builds new construction functions and features into our software, we don’t do it alone. It begins with looking to our customers and partners for feedback and advice on what they want most and carries through delivering a release with optimal value. In the Acumatica 2019 R1 release, Acumatica Construction Edition includes numerous enhancements and new features across Financials, Project Accounting, and Project Management. Contractors will see enhanced features to better meet the needs of their project teams with updates to Project Issues and RFIs including the ability to add RFIs and Project Issues from within Microsoft Outlook and the newly added Drawing Logs and Project Budget Forecast. We’ve also enriched the integration to Procore, making it easier for users to seamlessly work across Procore and Acumatica. Additional enhancements include a new Commitment Inquiry filter, Project Budget Control Warnings, and a new Pay when Paid report. In response to customer requests to better meet the needs of their project teams, there are new features and enhancements making Acumatica Construction Edition more intuitive and easier to use. Acumatica Summit 2019 attendees were able to see some of these new features live during the Day Two Keynote. For those who missed Summit, you can download the Keynotes now. Drawing Logs: Drawing Logs enable project teams to store drawings and sketches on a project. In case of changes or revisions to the initial drawing, the team member can create a revision and attach the updated drawing(s). Drawing Logs can be linked to Request for Information (RFI) and Project Issues making it easy to provide the necessary information in order to ask questions. Project Budget Forecast: The budget forecast feature allows project teams to enter and modify project budget forecasts and compare these forecasts with the actual project costs and revenue for each financial period. Users can forecast original and revised budget amounts and quantities for existing project budget lines for financial periods on the master calendar. Each project can have multiple budget forecast revisions. In a forecast revision, a user can distribute amounts and quantities of the project budget among the selected range of financial periods to speed data entry. By using forecast data, users can create generic inquiries and pivot tables. Project Budget Control Warnings: The project cost budget control warnings notify that when costs exceed the revised budgeted amount for a specific project key (Project, Sub Job, Cost Code, Account Group). The validation is analyzed at the project key level across all detail lines with the same project key. The validation includes released commitments and change orders per project key. Please note this is Phase 1 with additional features planned for a future release. Pay when Paid: The Pay when Paid reports display paid amount including retainage, total balance, original retainage, and unreleased retainage up to the specified financial period for invoices and retainage invoices. The reports do not consider paid amounts after the specified financial period. Users can compare what was paid by the customer (AR Docs by project with paid amount) to what they owe their subcontractors/suppliers (AP Docs by project with paid amount) when selecting AP Bills to pay. Request for Information (RFI) enhancements include attaching project files to an RFI, linking project Drawing Logs, attaching drawings with a zip file when sending the RFI, and creating an “Incoming RFI” into an “Outgoing RFI”. Incoming and outgoing RFIs help project teams manage communication between upstream owners, architects, and engineers and downstream subcontractors and supplies. Procore Integration has Improved navigation between individual mapping screens and the main mapping screen making it easier for users to seamlessly work across Procore and Acumatica. The General R1 release provides additional features that are of interest to both contractors and to the entire Acumatica community. Highlighting results in Inquiries provides visual clues on rows or columns of a generic inquiry based on customized conditions that have been introduced. Based on the alerts required, the system will highlight certain elements of a generic inquiry. For example, when inquiring on “opportunities”, the resulting grid can show those opportunities that have been won in green, those that have no owner in yellow, and opportunities that are late in red. Side Panel displays the details of a row on an inquiry screen. Changes to the data can be made in the side panel and the information displayed in the panel can include data or dashboard graphics without leaving the inquiry screen. In 2019 R1, significant improvements have been made to the Side Panel UI for improved usability. Improved help search via Machine Learning (ML) where inquiries made in the HELP menu inform the system what was useful and how to provide better help recommendations over time. Based on how effective the response to a natural language search has been, the system knows if it is serving up the correct results and adjusts. Custom color gives the company the ability to personalize the primary color of the company’s user interface. In addition, for multi-company or multi-branches, a different color can be specified for each branch to make it easier for employees to distinguish them. Multifactor authentication provides increased security where a user is granted access only after successfully presenting additional evidence of authentication in addition to the user credentials (that is, the username and password). Tax improvements enhances the integration with tax engines, including overrides for shipping address on AR and SO invoices and pro forma invoice screens to third-party tax providers, such as Avalara. Credit Card Processing improvements leverages the updated Authorize.Net plug-in for greater PCI compliance; tokenizing credit cards allows greater security for credit card payments. Location tracking uses the mobile device of service personnel to locate and record the GPS location of the device. See it in action. One-click invoicing enables the easy closing of an order, accounting for inventory, and generating of an invoice from a service order or an appointment. View the video. Thanks to contributions from Acumatica users, the Acumatica 2019 R1 product enhancements will benefit every industry, improving their ease of use and functionality. For contractors, the construction ERP improvements will aid project teams by increasing productivity and streamlining project management processes. 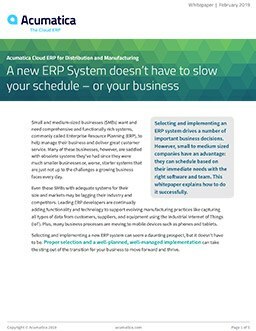 Further details about our latest release can be found in the Acumatica 2019 R1 Overview, and our team is standing by if you have any questions about Acumatica’s cloud ERP solution or would like a demonstration. Angela Bloomer is the Director of Product Management for the Acumatica Construction Edition with 18+ years of experience in software development for the construction industry. She thrives on managing the relationship between customers and development to design software that helps companies run their business. Once we made the decision to go cloud, other software couldn’t compare to Acumatica’s Construction Edition.